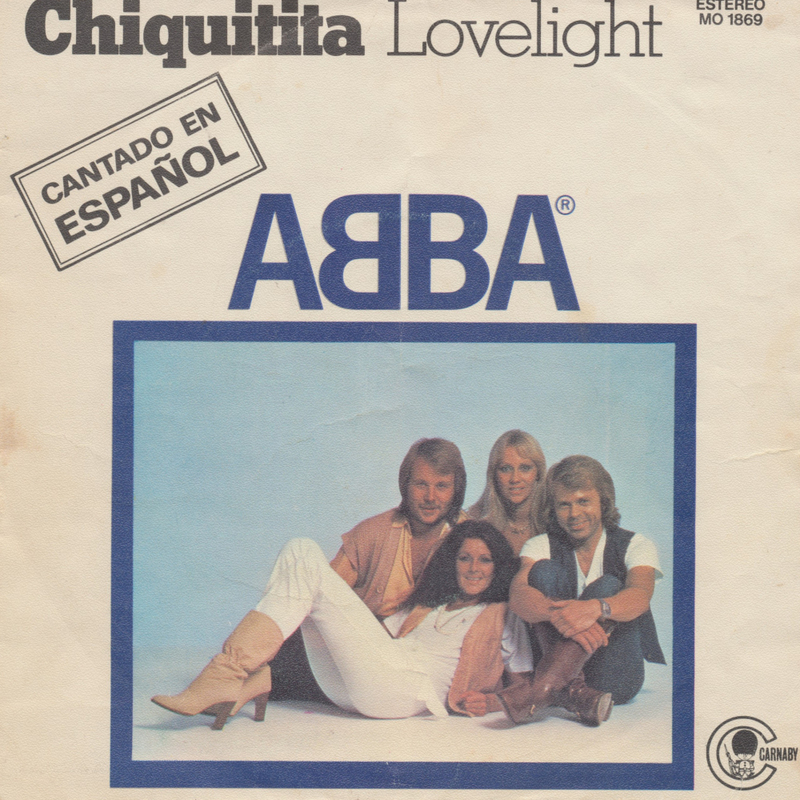 Abba was a successful band, but while they were having success in Europe and beyond, they also achieved quite a bit in the Spanish-speaking world. They translated some of their songs and released them as a single in those countries as well. Obviously, since these singles were never released around these parts, I never actually bought them. Since I recently completed my collection of 'normal' Abba singles, these rarities have started to catch my eye. I recently acquired two Spanish Abba singles, and this the first of them: 'Dame! Dame! Dame!' 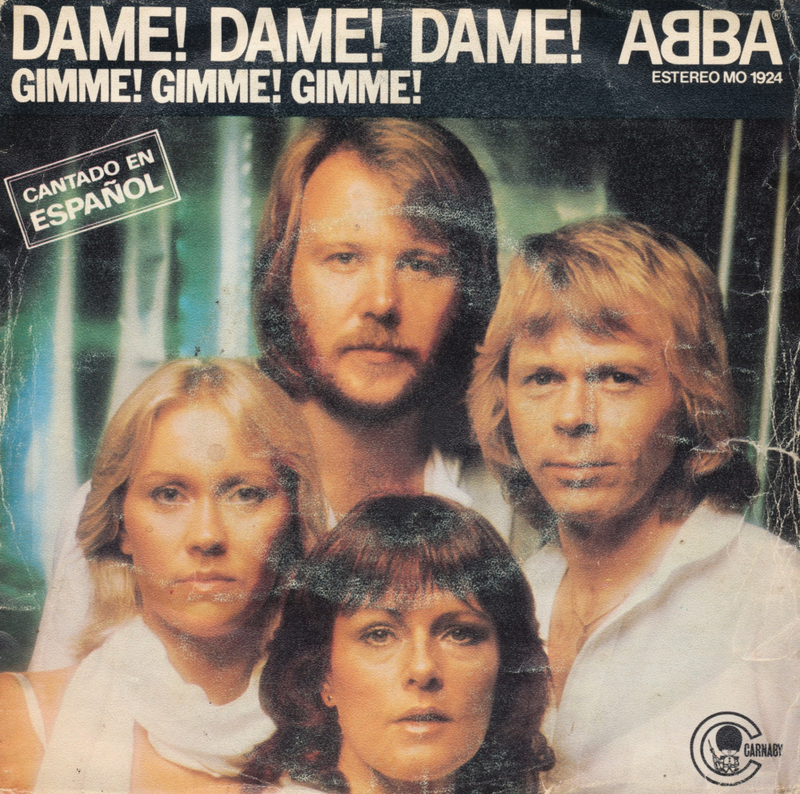 is the Spanish version of 'Gimme! Gimme! Gimme!'. Although it is not among their most successful singles, it has always been one of my own favourites, and hearing it in Spanish is something special. 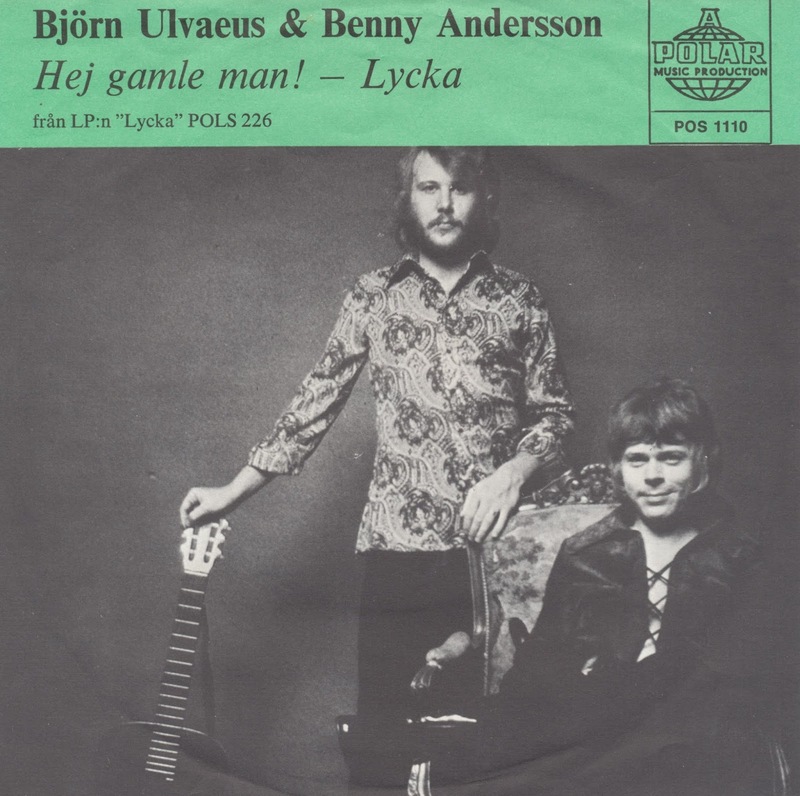 A long time ago, back in 1970, two Swedish musicians recorded an album together: Björn Ulvaeus from the Hootenanny Singers and Benny Andersson from the Hep Stars. They met in 1966 and started writing songs together soon after that. 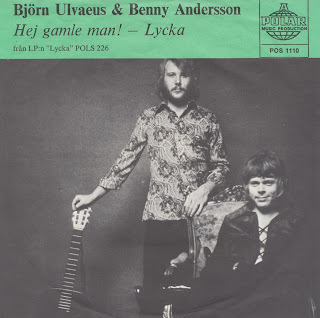 They released the album 'Lycka' in November 1970 and this single was taken from that album. 'Hej gamle man!' 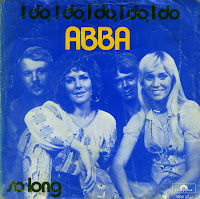 is considered by many as the first official Abba single, since it features Bjorn's wife Agnetha Fältskog and Benny's fiancee Anni-Frid Lyngstad on backing vocals. The lyric of the song is about a salvation soldier who was always on the square in Västervik to collect money for the Salvation Army. 'Here he goes again', you sigh, reading the title of this item. 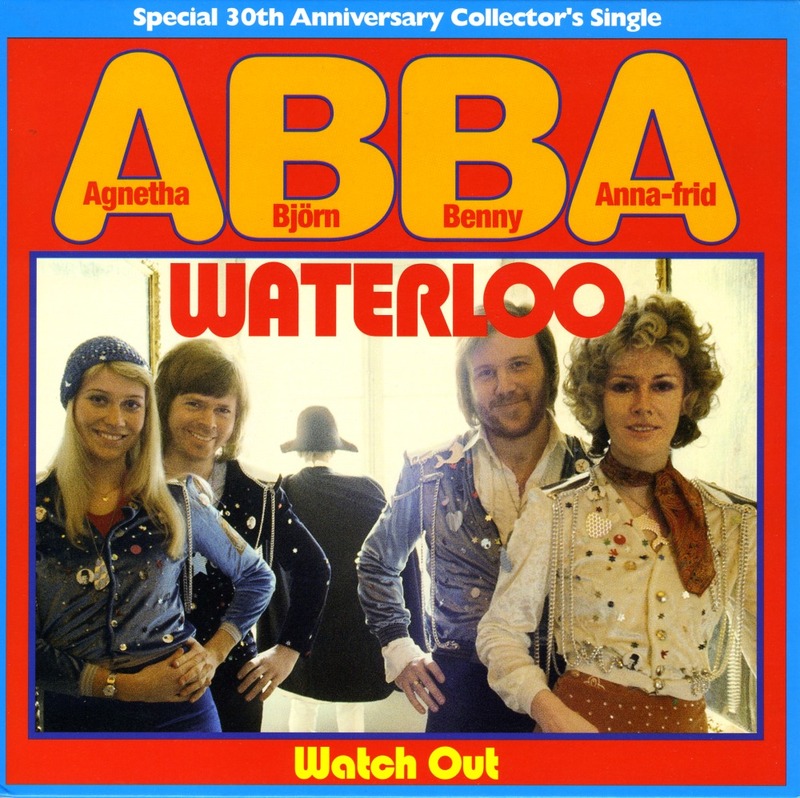 But I have to confess that I never bought an original 7" single of Abba's famous Eurovision song 'Waterloo'. Yes, I do have the 2014 re-release and even the 2004 re-release, but the original single somehow never reached my record collection. I corrected that mistake in part recently, when I bought the German and French pressings of the 1974 single. 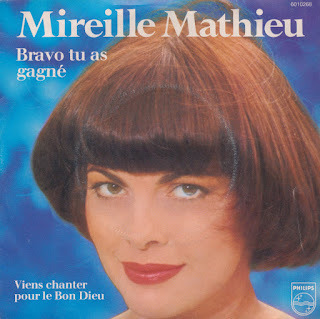 Of course there are some more versions to collect, and they will certainly appear on this blog when I get them, but I refuse to pay more than 1 or 2 euro for this single, which complicates matters somewhat. If I'd bought this single in the Eighties I would have paid far less as they were sold in every second hand shop in the world, but these days you have to rely on record fairs and everyone knows that the name Abba almost guarantees big sales numbers. Except for people like me, who aren't necessarily an avid fan of the band, but still want to get their hands on these old singles. Somehow, somewhere someone will hand over an old copy of this famous song for less than 'too much'. Abba have released ten albums during their career - give or take a few - and literally hundreds of compilation albums. No excuse is too weird to release yet another picking of their classic tracks. 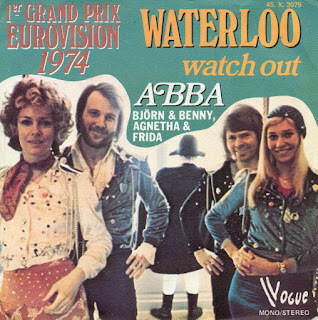 Forget the love songs compilations, jubilee albums, greatest hits, best album tracks and even the box sets though: here's the real deal: another re-release of their classic Eurovision single 'Waterloo'. 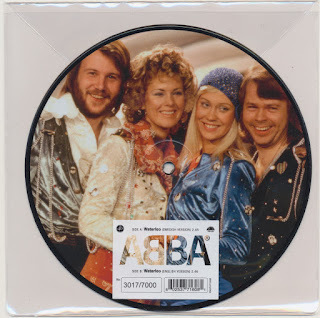 This time, it's a picture disc released exactly 40 years after they won the Eurovision Song Contest with THAT song. I was hesitant to buy it because, well, I already have the song a few times - but this really is a pretty record. It's just so damn irritating that fans of Abba have to buy the same songs over and over and over again. Fortunately, I'm not an Abba fan in that sense of the word. 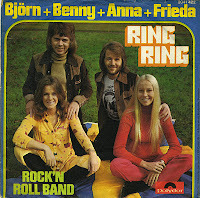 'Ring Ring' was originally a 1973 single by ABBA, which gave the group their big break in several European countries (although the rest of Europe, North America and Australia would be introduced to ABBA the following year). It was originally written in Swedish by Benny Andersson and Björn Ulvaeus, along with their manager Stig Anderson, and the translation into English lyrics was helped by Neil Sedaka and Phil Cody. This German single was actually released in 1974, after ABBA had won the Eurovision Song Contest with 'Waterloo'. It couples 'Ring Ring' with another previous single hit, 'Honey Honey'. When I was younger, so much younger than today, Abba was my favourite band. I got an album of their greatest hits as a souvenir after a holiday because I really wanted it, and I played it over and over again. One of my favourite tracks on that album was 'So long', which to me sounded like the hardest kind of hardrock I could imagine. Of course, Abba were never in the business of hardrock, but there is a certain rock edge to this song. It was released as a single in November 1974. Although musically similar to 'Waterloo', it was only a hit in Sweden, Germany and Austria, peaking at number 7, number 11 and number 3 respectively. 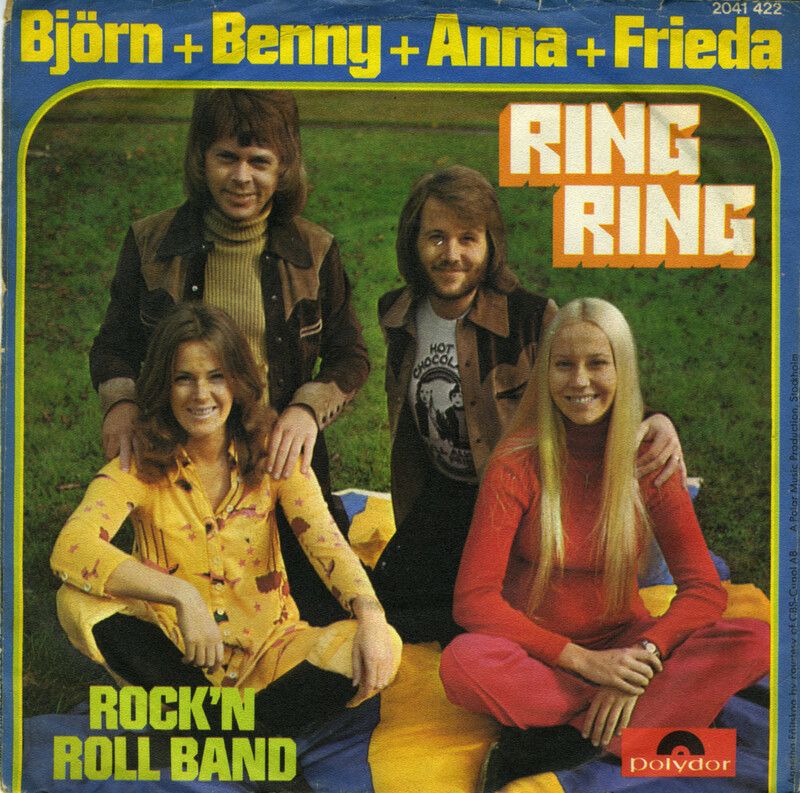 'Ring Ring' was written by Benny Andersson and Björn Ulvaeus. Their manager Stig Anderson wrote the lyrics with the intention of making a 'poppy' song and to make it more accessible to a universal audience, Anderson asked American songwriter Neil Sedaka to pen the lyrics for an English version, together with his songwriting partner, Phil Cody. Recorded in January, the song was submitted to the Swedish national final for the Eurovision Song Contest - and it finished third. Nevertheless, the song fared much better in the Swedish charts, both in its Swedish and English language incarnations, where it hit number one and number two respectively. Björn + Benny + Anna + Frieda had an international hit on their hands and decided to re-enter for Eurovision the next year - and the rest is history. I never managed to buy this legendary single, but finally picked up a copy last weekend. 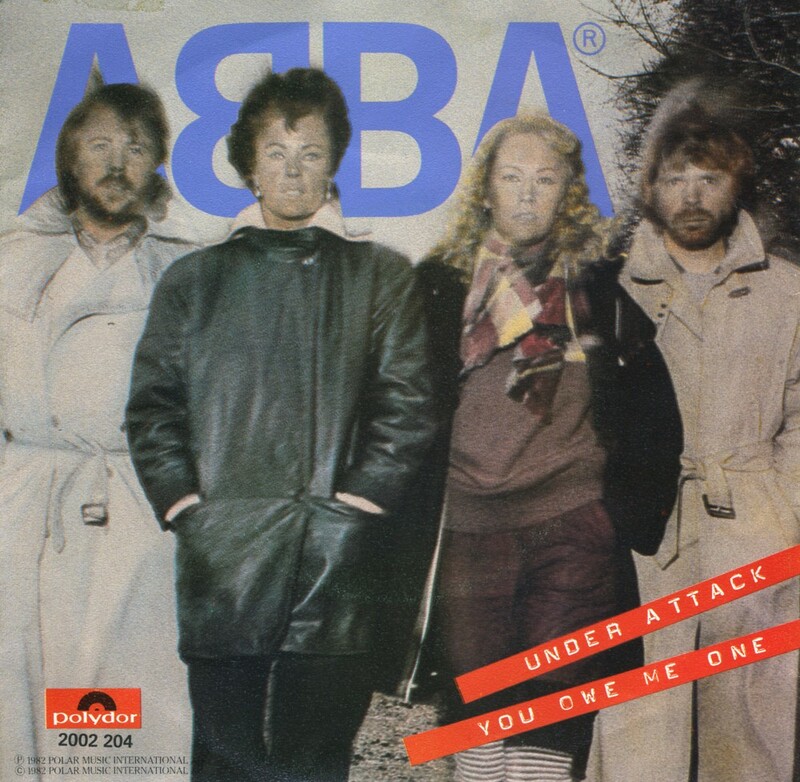 'Under attack' was recorded by Abba betwee August 2 and August 4, 1982. It was one of the tracks on what was to become Abba's final recording sessions, and released as a single from the compilation album 'The Singles: the first 10 years'. The video for 'Under attack' was made in November 1982, shortly before the release of this single. 'Under attack' was not a commercial success. The single did reach number 5 in the Dutch Top 40 and number 3 in Belgium, but in other countries the single fared less well. 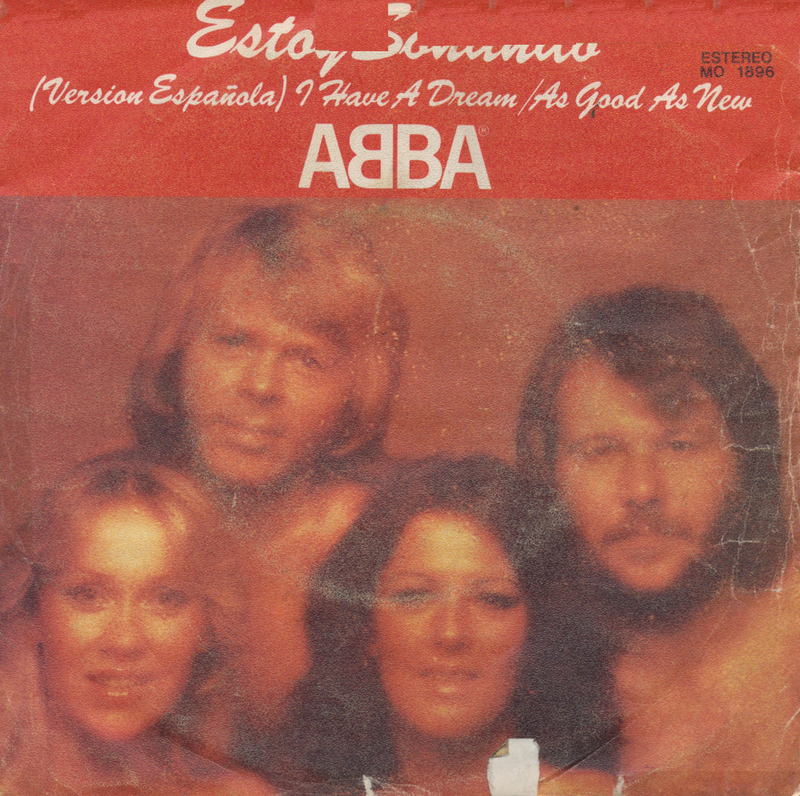 After the single's release, it was decided that ABBA would take a 'break'; however, they would not record as a group again. 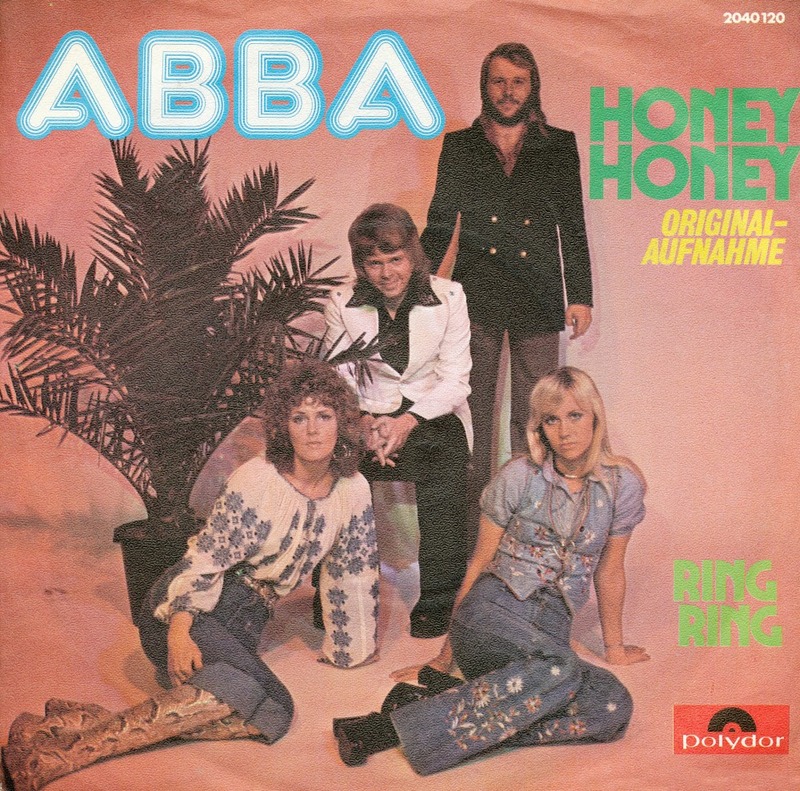 This French version of the single 'Honey honey' by Abba features a photograph of their performance of 'Waterloo', the song that gave them a Eurovision victory earlier on in 1974. 'Honey honey' was released as the followup to that hit around the world, with the exception of the UK. The single reached number 2 in Germany and number 4 in Austria and Switzerland. Elsewhere in Europe, it was less successful, peaking at number 16 in the Netherlands and number 12 in Belgium. 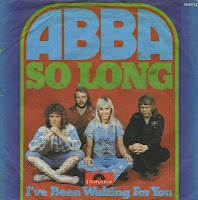 However, it was a hit for Abba in the USA, peaking at number 27. 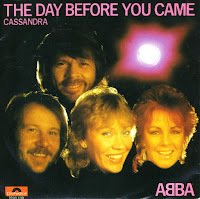 You can't tell from the sleeve design of this single - which is absolutely horrible - but with 'The day before you came' Abba arguably reached the creative peak of their career. 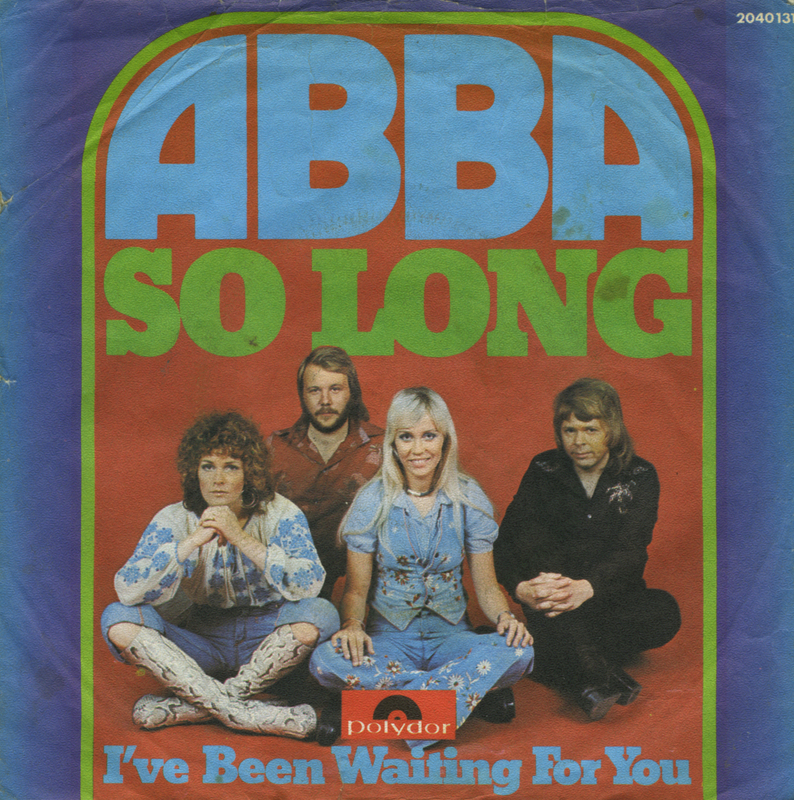 It's a very melancholy song, written by Björn Ulvaeus and Benny Andersson while they took time off in 1981 to write new material for Abba as well as beginning to create their first musical, 'Chess'. 'The day before you came' was recorded in August 1982. To date, this song was the last song the group ever recorded together in the studio. Agnetha performed the lead without the lights on and said that the mood had become sad and everybody in the studio knew that 'this was the end'. 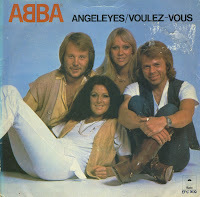 In the UK, 'Angeleyes' and 'Voulez-vous' were released as a double A side, because the record company believed 'Angeleyes' would appeal more to the record buying public than 'Voulez-vous', which was released as the A-side track in most other countries. They were not wrong: the single peaked at number 3 in the UK singles chart. 'Angeleyes / Voulez vous' was the first Abba single in the UK to be released in a picture sleeve, as all previous Abba singles were released in a standard 'Epic' company sleeve. The single was also issued in several different colours of vinyl, although my copy is pressed on 'standard' black vinyl. 'One of us' was one of the last songs Abba recorded for their final album 'The visitors'. Like more songs around that time, Björn Ulvaeus and Benny Andersson were writing about their personal lives, which involved the divorce of their female band members, Agnetha and Frida respecrtively. 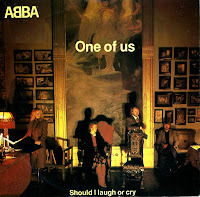 Despite the somewhat depressing context and reservations by manager Stig Anderson, 'One of us' was released as the first single from 'The Visitors'. It reached number 1 in Belgium, the Netherlands, Germany and Ireland. In the UK, it peaked at number 3. The song was parodied in the UK television programme 'Not the nine o'clock news', in which the chorus was sung as 'One of us is ugly, 1 of us is cute / One of us you'd like to see in her birthday suit / Two of us write music, two have way a song /Sorry, in translation, that line come out wrong'. 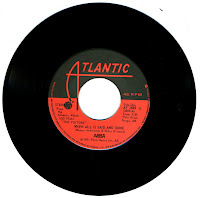 'When all is said and done' is a track from Abba's 1981 album 'The visitors'. It was released as a single in Australia and the USA - and this is the sleeveless US pressing. Written during a time of emotional turmoil, Björn Ulvaeus has admitted that the recent divorce between Benny Andersson and Frida Lyngstad was at the back of his mind during the songwriting process for this song. Björn sought approval from Benny and Frida before the group began working with the song. When recording began in March 1981, only one month had passed since their separation. 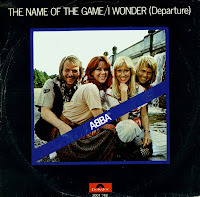 'The name of the game' was the first song to be recorded for Abba's fifth album, which would be named 'The album'. Written by Björn Ulvaeus, Benny Andersson and Stig Anderson, it was their most complex composition yet and contained the influences of the laid-back California sound of the day. An edited version of 'The name of the game', which omitted the entire second verse of the song, reduced the length of the track from its original 4:51 to 3:58. This was released on a promotional single in the USA. 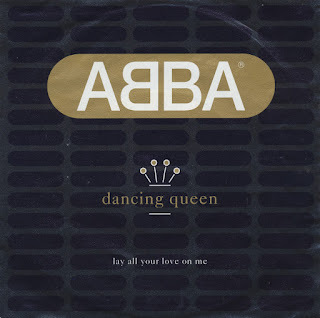 Somehow this edited version found its way onto various cd releases, including the compilation 'Abba Gold' and the 1999 digital remaster of 'The album'. Fortunately, the original single features the song in its entirity. Personally I was never too fond of this Abba track. The most amusing thing about it was the title. The song was written by band members Benny Andersson, Björn Ulvaeus and their manager Stig Anderson. The song's release came shortly after their previous single, 'So long', performed disappointingly in terms of charts and sales. (Although the B-side of 'I do, I do, I do, I do, I do' was 'Rock me' in most cases, this Dutch pressing has 'So long' as the B-side.) 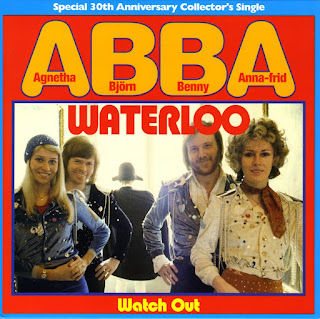 After the success of 'Waterloo', Abba were having difficulty establishing themselves as an act with longevity. 'I do, I do, I do, I do, I do' became a significant improvement on the international charts. It peaked at number 3 in the Dutch Top 40 and topped the charts in Australia, New Zealand, South Africa and Switzerland. When Abba broke up in 1982, the world still expected to hear more from the band. They never officially announced that they would never record together again, so the hope was still there when this single was released. 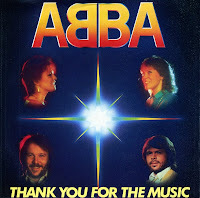 'Thank you for the music' was originally released in 1977, but in 1984 it was re-released to promote a new compilation album entitled 'From Abba with love', which contained a curious collection of tracks: eight hit singles, one solo track by Frida, one solo track by Agnetha, two B-sides and two album tracks. Both the album and the single were only released in the Netherlands. The single was not a big success: while the album topped the Dutch albums chart, this single only reached number 38 in the Dutch Top 40.